Many people look forward to the holiday season and the start of a New Year. It often provides an opportunity to spend quality time with family, take a few days off from work, or go on a winter getaway. While the holiday season can be a fun and joyous time, it can also be very stressful. For most of us, the combined effort of gift shopping, attending social events, and entertaining guests can quickly become too much to handle. In addition, going over your gifts “budget”, a lack of time, and the hype and commercialism of the season causes increased stress for many people. During the holidays, stress takes on a different character than at other times of the year. Men and women alike feel a duty to make the holidays the best they can for their families and often fail to do the one thing required during this magical time of the year – be selfish. Selfish in this sense means taking some personal time each day to do what you want to do and also taking care of yourself (what a concept!). Holiday stress has a particular impact on women, who feel like it is their responsibility to take charge of many of the holiday celebrations, particularly the tasks related to preparing meals and decorating the home. Women are more likely than men to report an increase of stress during the holiday season. An article from The Washington Post reports, “Despite making advances in education, shattering glass ceilings in the workforce and in politics, and gaining more economic independence in the past 40 years, women, on average, still do twice as much housework and child care as men, even when they work full-time outside the home.” Add the holidays to this equation, and you now have a “third shift” of work added to your plate! In addition, women have a harder time relaxing during the holidays and are more likely to fall into bad habits to manage their stress, like comfort eating. Ladies, are you feeling me? During this time of craziness, make sure you schedule in time for you. Even if it’s five minutes in the morning to sit (alone) and enjoy a cup of coffee or tea while reading your favorite magazine/book or scrolling through Pinterest. If you take a little time each day to do something you enjoy, your mind, body, and soul will thank you for it! For most people in this country, the New Year offers hope and a reminder that there is always opportunity for change and self-improvement. In the New Year, most individuals would like to improve their health or lose weight, get their finances in order, and improve their relationships with family or a significant other. The tendency to begin the New Year with the very best intentions soon becomes lost in the return of the normal work, school, and life schedules. Some people may feel as though they have failed with these resolutions as soon as the first few weeks of January pass by! Going into the New Year, make sure you set realistic goals. Time-lining your goals ensures you are not trying to do everything in the first 30 days of the New Year and gives you something to work on all year long. Slow and steady wins the race and this same logic applies to your New Year’s resolutions. Although the holiday season can be a stressful time, there are several ways to minimize stress and anxiety so you can thoroughly enjoy this festive time of year. For starters, if you are new to the holiday craze with kids, do not, I repeat, DO NOT, buy the Elf on the Shelf. Just ask veteran parents. There is nothing more stressful than waking up from a deep sleep at 2am only to remember that you forgot to move that stupid Elf! 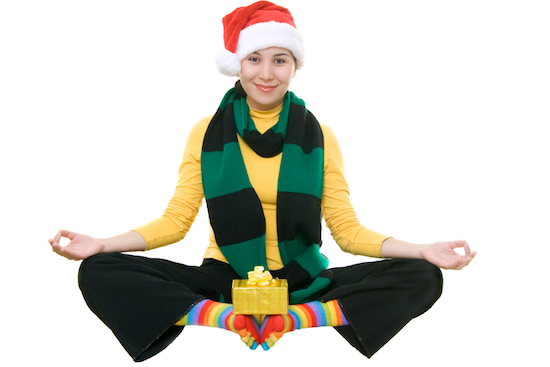 Reduce your stress by not taking on additional holiday responsibilities. It is okay to say “no” to baking five dozen cookies for the PTO cookie exchange! If you usually host most of the holiday festivities at your house, this year, let someone else host – it is okay to give up the reins this year (see what I did there?). Holiday gifts and gift shopping are one of the main causes of stress for most people during the season. Shopping during your few hours of downtime often means shopping with other frustrated consumers, trying to get the best gift at the best price. But keep in mind, it’s not the gift that counts – seriously. It really is the thought, the remembering something special, that counts the most. Recalling a conversation with an aunt about an old favorite photo and then getting that photo framed for her is more meaningful then spending a lot of time and money on a trinket that has no sentimental value. Finally, not to sound like a broken record, but take time for yourself! If your neck and back are getting extra sore from all of the festivities, or your headaches are increasing because of shopping and the holiday crowds, make time to focus on you. Workout, meditate, get adjusted, treat yourself to a massage, get an acupuncture treatment, these are all great ways to take care of you and insure your body is ready for the holiday season.